December is traditionally a time for looking back, assessing the year's highs and lows, and waxing nostalgic about the way things used to be. While there will be plenty of "Top Ten" lists published online, memories of days gone by can take surprising hold of one's thoughts and emotions. No, they can't take that away from me." Whether one thinks of Elaine Page singing "Memory" from Andrew Lloyd Weber's long-running musical, Cats, or Barbra Streisand singing the title song from The Way We Were, each song's lyric has a sense of resignation, an overwhelming sadness about what once was and will probably never again come to pass. And yet, for some of us, memories are to be fondly cherished and celebrated with a zest for life's ironies. Given a choice, I much prefer the kind of nostalgia shared by Bob Hope and Shirley Ross in this brilliant musical number (which won the Academy Award for Best Original Song) from The Big Broadcast of 1938. Back when I was growing up in Brooklyn I developed an undying passion for ocean liners, the great floating palaces that went out of fashion with the introduction of the jet plane. Whenever our family drove into Manhattan, the biggest thrill of the day for me was the moment when we rounded a turn on the West Side Highway and I could see the smokestacks of the ships berthed between Piers 84-97 (luxury liner row). Those were the days when anyone could pay 50 cents for a ticket to board the ship prior to its sailing to visit departing passengers or just explore the liner's decks (I still remember the thrill of the Sicilian style pizza on the Cristoforo Columbo). Here's a shot of my friend Marc Kutner (on the left) and myself sitting in two deck chairs aboard the M.V. Britannic prior to its departure from New York. Several years ago, the fortuitous combination of a new printer, a sale on one-dollar picture frames, and the ability to download images of old ocean liners prompted me to redecorate one of my bedrooms. All my old "friends" from childhood -- from the Titanic, Lusitania, Normandie, Lurline, and Caronia to the Ile de France, Oslofjord, Kungsholm, Liberté, and Brasil -- now smile down on me whenever I'm in that room. Thus, it was with no small amount of delight that I recently watched Mr. 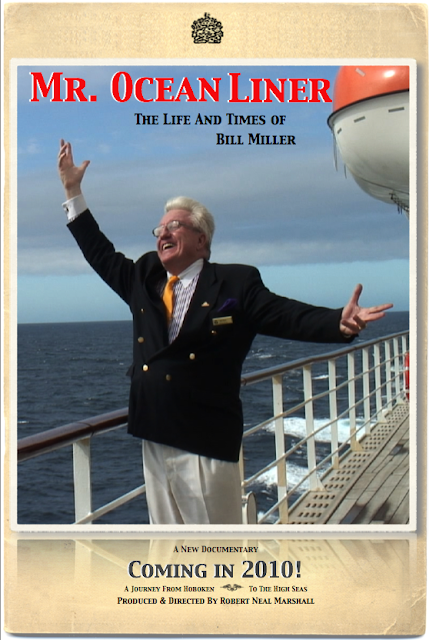 Ocean Liner -- The Life and Times of Bill Miller. For those who are not ocean liner fanatics, William H. Miller grew up in Hoboken, New Jersey, where he was able to watch ocean liners steam in and out of New York Harbor from the window of a relative's home. With the gumption that often seems to reside in the domain of the young, Miller struck up a correspondence with one of the 20th century's great maritime historians, Frank O. Braynard. Miller co-authored several books about ocean liners with Braynard before carving out a niche for himself as a guest lecturer at sea and the author of more than 70 books about ships. Produced and directed by Robert Neal Marshall, Mr. Ocean Liner premiered aboard the Queen Mary 2 on July 1, 2010. For many years, Miller taught school in New Jersey, carefully dovetailing his cruises and lectures to match up with his teaching responsibilities at home (in a wonderful segment, he describes how he explained to his contacts at Cunard Line that the only way he could make it back from Europe in time to start teaching in the fall was if they flew him back to New York on the Concorde). The joy of watching Mr. Ocean Liner is twofold: First, there are the glowing tributes from colleagues who have become Miller's close friends over the years. 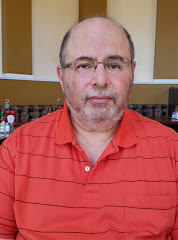 More intoxicating, however, is the enthusiasm of a grown man who has never lost his boyhood fascination with ocean liners or the thrill he gets just from talking about the ships he loves so dearly. While watching Mr. Ocean Liner, I kept hoping the film would include more shots of ships and more images from the advertising campaigns that used to romanticize travel at sea. While attending the world premiere of A Christmas Memory down in Palo Alto, I found myself wishing the creative team had been able to cut more material and hurry things up. Based on a short story by Truman Capote, A Christmas Memory's book is by Duane Poole, with lyrics by Carol Hall and music by Larry Grossman. Grossman notes that: "I regard A Christmas Memory as a piece of Americana, a piece of our literary heritage. The fact that it is as popular and as beloved as it is creates a responsibility for transferring it to the stage." Under Robert Kelley's sensitive directorial guidance, Joshua Park plays the adult Buddy (a successful writer who has returned home in 1955 to Monroeville, Alabama to arrange for the sale of the home in which he grew up with his three distant cousins). 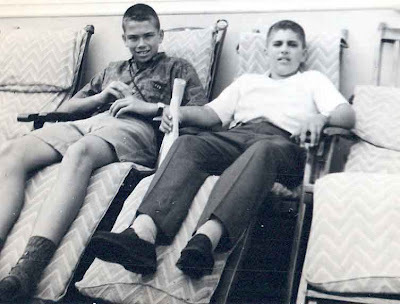 Memories of the past, including Nelle Harper (the annoying tomboy next door who is obviously Harper Lee), the nosy mailman, and the family maid, flood through his mind. Numerous flashbacks take the audience back to 1933, when President Franklin Delano Roosevelt was battling the Great Depression and millions of Americans were struggling to make ends meet. As adult Buddy and Anna Stabler (Cathleen Ridley) reminisce about cousin Sook's annual ritual of baking fruitcakes for the holidays, the audience is caught up in the drama of a household ruled by Jenny (Eileen Barnett), a single woman who bosses around her hypochondriac brother Seabon (Richard Farrell) and eccentric sister. Although two musical numbers stand out ("Alabama Fruitcake" and "Mighty Sweet Music"), much of the score is quite ordinary and reminiscent of the early work of Tom Jones and Harvey Schmidt. Ironically, I kept thinking of Stephen Sondheim's song, "In Buddy's Eyes" (from 1971's Follies,) at several moments during the performance. Plenty of ghosts hover over the stage during A Christmas Memory and they're not the ghosts one might expect. There are many moments when Penny Fuller's Sook takes on the fanciful spirit of a poor man's Auntie Mame or a rural answer to Ruth Gordon's mischievous Maude. During "Buddy's Midnight Adventure" (in which he and Nelle are chased by HaHa Jones), I found myself thinking of "The Small House of Uncle Thomas" ballet from The King and I. Although the opening night audience at Theatreworks responded enthusiastically to the show, in truth this is a very minor and modest effort to create an alternative to the usual Christmas fare of The Nutcracker, Handel's Messiah, Peter and the Wolf, Hansel und Gretel, and A Christmas Carol. Where I think A Christmas Memory will find lasting success is in university theatre departments and community theatres around the nation.